Perhaps you haven’t thought about putting a rug in your kitchen. Get ready to change your mind: here are five ways rugs can transform your kitchen space. Kitchens are usually high traffic spaces – kids running around, things falling on the ground, everybody rushing to get out the door and start their day. Your floors don’t have to take a hit. Use some well-placed rugs to brighten up and soften your kitchen area while protecting the hardwood underneath. Bonus: comfy carpet means your family’s feet will thank you. Worried about food-related spills? No need — try an easy cleanup option like these indoor-outdoor rugs. Kitchens can be so…monotone. Between all the tile, granite, marble and stainless steel, your kitchen might feel a bit sterile. Never fear: the power of the area rug is here! Area rugs are an easy way to incorporate color and texture in your kitchen and break up all those hard surfaces. Try adding a rug underneath your center island to center your space and create cohesion with the rest of your décor. Feel free to step outside the box here: an eye-catching pattern or bold color, like this indigo blue rug, will add some freshness to your kitchen. 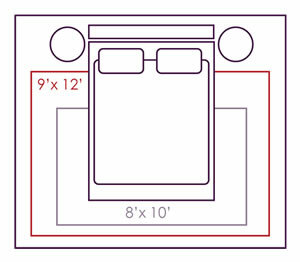 Plus, an area rug is an easy way to revamp your kitchen without the hassle of a remodel. Kitchen renovations are expensive, time-consuming and usually impractical. Area rugs are an easy way to transform a space without too much effort. Pick soft fabrics and inviting colors to break up the monotony of tile or hardwood and add some texture. Ever feel like your feet and back hurt after doing the dishes? Putting a small rug below your sink can add some cushion and give your toes a much-deserved break. Plus, a soft rug will absorb noise and make your kitchen less of an echo chamber, transforming the harsh corners and surfaces of your kitchen into something homier. And if some water from the sink gets on the rug, no biggie – just pat dry. For those of you with long skinny kitchens, do not despair — there’s a solution to your kitchen woes too! Placing a patterned or textural runner down the length of your kitchen can keep your floors pristine and pull the entire kitchen together. 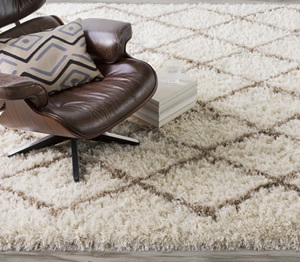 Try a patterned rug like this that pulls in colors from your backsplash or appliances for a more cohesive look. Bonus: a long runner will create cohesion with the surrounding rooms and draw the eye outward. An area rug beneath your kitchen table or in your breakfast nook will put the focus on what’s important: eating. Protect your floor from scratches from your table and chairs while softening noise. Try pulling in colors from your kitchen to create flow.